However, there are a number of risks with using such providers. While a low price can be enticing, the long-term costs are something you should carefully consider. None of the providers listed above offer asset-level security tracked at the user level. What’s that mean? It means that you can control exactly who can view a individual video. So, even if a user can get to a video, they can’t view it unless you’ve given them access or allowed your learning management system (LMS) to automatically provision access. Without asset-level security, your expensively produced, copyrighted video is out there in the wild, and, once a user has accessed it, it’s very possible that they are sharing it with others or even downloading it. Even when password-protected, each video is only provided with a single, shareable password. And domain-restricted embedding is easy defeated by anyone who can use Google. If your LMS is used to deliver continuing education content, your courses are either providing a member-only benefit or are revenue-generating assets or both. Without the proper security, you may be losing members and money without even knowing about it. Many of the providers listed offer do not offer single-sign-on with your organization’s identity provider for administrative users. When using a video provider such as Sprout, Wistia, Vimeo or YouTube, whose account are your employees using to manage your organization’s videos? Their own personal account? Youtube requires a Google account, which may be a personal account. Or, it may be a shared organization account. In either case, consider what happens when an employee leaves the organization. You’ll either have to scramble to update passwords, or worse, you may lose access to videos that are in an account owned by an ex-employee. Hopefully not a disgruntled one! Without single sign on for viewers, you cannot tell if a learner has viewed a video or how much was viewed! While some providers will show you aggregate viewing time, hotspots, or a total number of views, there is no way to measure the impact of the video on individual learners’ performance or member engagement. And thus your outcomes measurement may be inaccurate if you are including users who never watched your educational content. If you can’t measure it, you can’t improve it. When using an external video provider, your LMS administrator will be uploading videos, copying URLs, and managing admin users in yet another application. This is manual effort that can result in mistakes and redos. The admins have to go back and forth between applications. Your data is siloed and must be manually stitched back together for reporting. Slow, manual tasks like this prevent your organization from using valuable time to create more innovative educational products resulting in higher member satisfaction and association revenue. EthosCE provides a secure, controlled, trackable solution for single-sign-on with video. 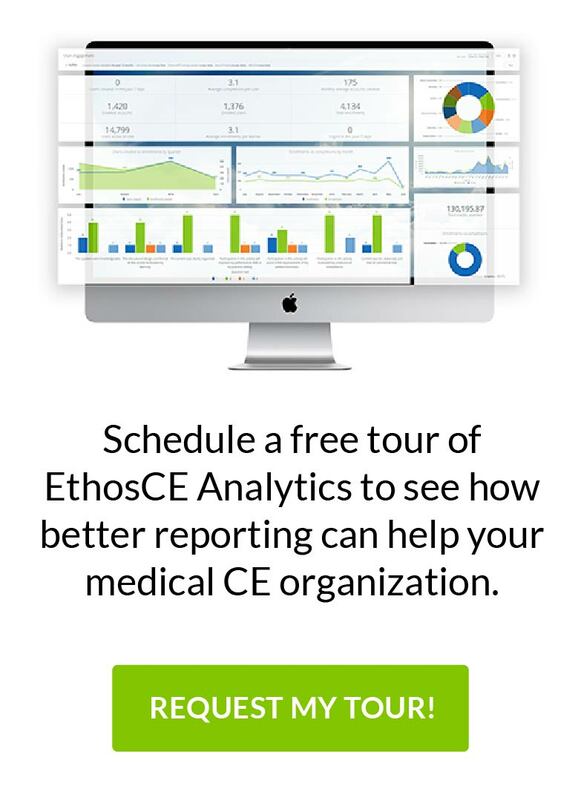 At Ethos CE, we’ve been helping leading medical associations deliver video by making their LMS technology work for, rather than against, their CME goals. We offer a robust LMS with integrated video hosting, allowing you to focus on education instead of tracking down your videos outside your LMS.